Cattails are invasive aquatic plants that thrive on the edges of streams, ponds and swamps. The herbicides used to kill them ordinarily require a surfactant registered for use on aquatic plants. A surfactant is an agent that allows the herbicide to spread more evenly on water and not form beads. 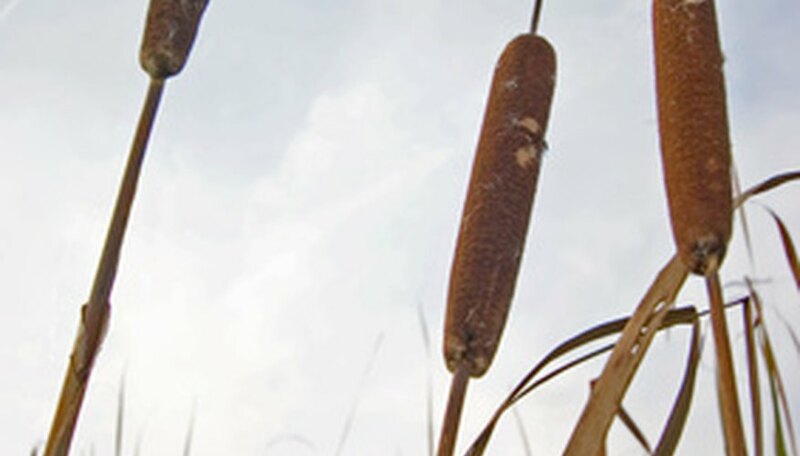 Herbicides containing glyphosate are most often recommended to kill cattails. Always follow the directions on the manufacturer’s label. Herbicides containing glyphosate are broad spectrum and systemic. They are absorbed by the plant and act more slowly than contact herbicides. A systemic herbicide kills the roots and the rest of the plant. Glyphosate herbicides are more expensive than those that kill on contact, but they’re more useful to eliminate a perennial stand. Cattails can be sprayed by walking along the shore. It isn't necessary to spray from several angles as you would with a contact herbicide. Apply glyphosate herbicides just after the seed head has formed. This is when cattails begin to store food in their roots. Diquat is the fast-acting chemical ingredient in commercial herbicides that kills on contact. Since diquat kills only the parts of the plant it touches, it's necessary to cover an entire cattail plant to eliminate it. That means cattails must be sprayed from several directions. Diquat herbicides do not kill the root system. Since new plants can grow from these roots, using a diquat herbicide requires yearly applications. Apply diquat when the cattails are green and actively growing. There may be state laws governing the use of diquat in your area. Check with your local agricultural extension service or state department of agriculture to find laws that may apply. Imazapyr inhibits a crucial plant enzyme in cattails. Herbicides containing glyphosate and imazapyr bind to particles suspended in the water and on the bottom where they rapidly become inactive. There is no waiting period for irrigation or using the water for livestock. Plant-killing formulations containing imazamox are broad spectrum and systemic. One danger of using imazamox and other herbicides to control cattails in a pond is that rotting dead plants can deplete oxygen in the water, killing fish. If a pond is heavily infested with cattails, it may be best to kill them in sections and let each section decompose for two weeks before treating another section. How Do Herbicides Affect Photosynthesis?